If you are looking for a single source of current state of play with the Indian space programme from a diverse collection of writers from in and outside India – this is it. This book is a collection of 26 chapters written by authors with expertise and first-hand experience covering a broad range of topics. 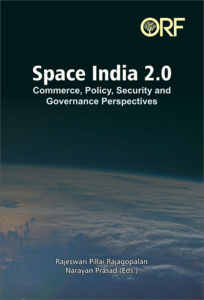 The book is divided into to five themes on Space Commerce, Policy, Security, International collaboration and concludes with Sustainability & Governance. The authors include former ISRO director, academics, scientists, researchers, legal experts and some from the growing community of space start-ups. Authors come from USA, Australia, Japan, France and Russia give a unique international perspective on the policy and evolution of the space activities in India. Each chapter is written as a standalone piece and whilst there is some repetition the varied writing styles is quite refreshing. Between them the contributors discuss the increasing commercialisation of ISRO’s operations, the growth of space start-ups, India’s new ground-based assets to aid space debris monitoring, opportunities for India-Australia collaboration, the remarkable growth of internet users in India and increasing reliance on digital services for the benefits of all of India’s 1.2 billion population. The space security section deals with some of the most fraught and testing topics that rely on space assets. In his chapter, Ajey Lile describes India’s conventional military assets with a surprising degree of quantitative data. For example, the Indian army has 1,300,000 active personnel, 6,464 tanks and 290 self-propelled guns. This level of detail a decade ago would probably have been seen as a security breach. As a retired wing commander, Lile is likely to have the authoritative sources for this data and clearance to put this information in the public domain. Lile highlights a mismatch between India’s space strategy, its current space assets and the political indecision on how space should be used for national defence. Similarly, in her paper, Rajeswari Pillai Rajagopalan addresses the changing geopolitical landscape around the potential military use of space. She points to the absence of political and financial commitment from the Indian government which does not bode well for India’s national security in the long-term. Kumar Abhijeet emphasises India’s need for domestic space legislation to support not only the emerging private space sector but India’s obligation to international treaties such as the Outer Space treaty. In the 1960s there were just two countries with space programs, now there are around 60. International collaboration will be key to ensuring that space around the Earth used by communication, navigation and meteorological satellites is kept free of hostile activities that have marred human history on Earth. In its own way, this compilation from international authors is an example of the collaboration essential for humanity’s eventual use and exploration of space. The best part was a bunch of new writers that I had not come across before. I expect to read more of their work in the future. I will conclude with my usual whing regarding the absence of a back-of-the-book index and a few typos that should have been picked up during proofreading.